Universal Music launched their Umusic UK Artist Gateway last month. It’s a data-driven catalogue of all of Universal’s UK artists and their discographies, which aggregates information in one place for artists, fans and software developers. Because of our experience in the area of Linked Data and RDF, were brought into the project by Martyn Davies of SixTwo Productions to help with the RDF API for artists and releases. When we joined the project SixTwo had already started work on the Ruby on Rails app which powers the site. Taking inspiration from existing Music Ontology work by the BBC, MusicBrainz and others, we designed the structure of the RDF, and implemented some Ruby libraries (heavily influenced by code already used in our PublishMyData platform) to take data from their relational database and spit out RDF in various formats. 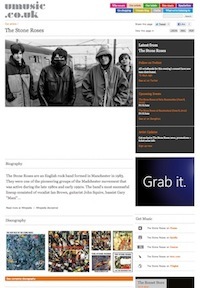 On each artist and release page there are links in the header which can be used to retrieve details about that resource in JSON, XML or RDF (see The Stone Roses or The Second Coming for examples). Note: even though there’s only a button for RDF, you can get the data as Turtle or N-Triples too by using the extensions .ttl or .nt, or by making an HTTP request with the appropriate accept-header. The RDF for each artist includes links to the releases in their discography, their homepage and their MusicBrainz, Wikipedia, Twitter, Songkick, Soundcloud, Vevo and BBC identifiers (where they exist). In the releases’ RDF, there are also links to the relevant MusicBrainz, Amazon and iTunes identifiers. You can read more about the Artist Gateway on the Umusic blog.